PBS Annual Meeting, Austin, TX, May 12, 2015 – Today at the PBS Annual Meeting, a gathering of member stations from across the public media system, PBS KIDS announced the premiere date and voice talent line-up for NATURE CAT, a new animated series for kids ages 3-8. 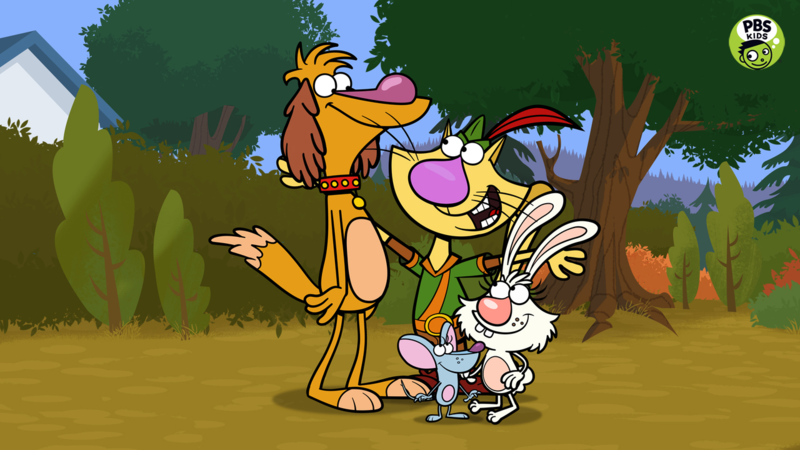 Designed to encourage children to explore and develop connections with the natural world, NATURE CAT will premiere on Wednesday, November 25, 2015 on PBS KIDS (check local listings). Digital content related to the series, including games, streaming video, hands-on activities and parent resources, will be available in the fall as well. Created by brothers David Rudman (“Cookie Monster” and “Baby Bear” on SESAME STREET; “Scooter” and “Janice” on The Muppets) and Adam Rudman (Tom & Jerry, SESAME STREET, CYBERCHASE), NATURE CAT is a co-production of Spiffy Pictures and WTTW Chicago. Major funding for the series will be provided by the Corporation for Public Broadcasting (CPB) and the Van Eekeren Family, founders of Land O’Frost. Press materials for NATURE CAT are available on PBS PressRoom. PBS KIDS, the number one educational media brand for kids, offers all children the opportunity to explore new ideas and new worlds through television, digital platforms and community-based programs. Kidscreen- and Webby-award winning pbskids.org provides engaging interactive content, including digital games and streaming video. PBS KIDS also offers mobile apps to help support young children’s learning. The PBS KIDS Video App is available on a variety of mobile devices and on platforms such as Roku, Apple TV, Amazon Fire TV, Android TV and Chromecast. For more information on specific PBS KIDS content supporting literacy, science, math and more, visit pbs.org/pressroom, or follow PBS KIDS on Twitter and Facebook. Spiffy Pictures, founded in 2003 by David and Adam Rudman, is a creative development and production company specializing in family entertainment. The Emmy Award-winning creative team has created, produced, written and directed live-action and animated projects for Nickelodeon, Disney, MTV, Comedy Central, Sesame Street and Warner Brothers. Their projects include creating and producing the Emmy & Prix Jeunesse-nominated Jack’s Big Music Show for Nick Jr, the Emmy-nominated Bunnytown for Disney and Nick Jr.’s Parent’s Choice Award-winning Curious Buddies brand of home videos. Spiffy Pictures recently produced a puppet adaptation of Scooby Doo for Warner Brothers, titled Scooby-Doo! Adventures, The Mystery Map. Visit us at www.spiffypictures.com. WTTW Chicago, a division of Window to the World Communications, Inc., is a premier producer and presenter of original, high-quality content for both public and commercial distribution. For almost 60 years, WTTW has introduced a wide array of groundbreaking cross-platform programming — reflecting the world’s rich and diverse arts and entertainment scene, as well as education, politics, public affairs, business and religion — to a national audience. Follow WTTW on Twitter and Facebook. The Corporation for Public Broadcasting (CPB), a private, nonprofit corporation created by Congress in 1967, is the steward of the federal government’s investment in public broadcasting. It helps support the operations of more than 1,400 locally-owned and operated public television and radio stations nationwide, and is the largest single source of funding for research, technology and program development for public radio, television and related online services. For more information, visit www.cpb.org.